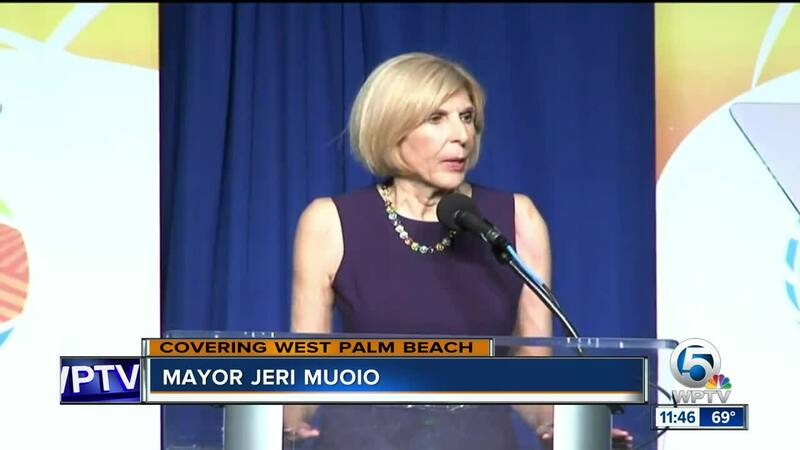 West Palm Beach Mayor Jeri Muoio delivered her final state of the city address on Thursday. WEST PALM BEACH, Fla. — West Palm Beach Mayor Jeri Muoio delivered her final state of the city address on Thursday. She laid out her priorities for the future one last time. "I challenge the next mayor, to make implementation of this framework one of the cities greatest future achievements," said Muoio. Muoio cannot run for office again because of term limits. She has been mayor since 2011. The election to decide the next mayor of West Palm Beach will be in March. Thank you everyone for being here and for being a part of my eighth and final State of the City address. Before I get started, I would like to thank the Chamber of Commerce of the Palm Beaches for graciously sponsoring this event each year. Thank you, Dennis Grady and Evelyn Hopkins. The Chamber has always been a great partner of the City, because we can always count on the Chamber. Thank you, also, to Tara McCoy and Good Samaritan Medical Center for presenting today’s event. Next, I’d like to acknowledge and thank five people who have helped me lead this City: Our City Commissioners. Commission President Paula Ryan, Commissioners Keith James, Cory Neering, Christina Lambert and Kelly Shoaf. You’ve made my eighth and final year important for the City and memorable for me. Finally, if you are a City employee. Please stand. Words are not enough to express the depth of my gratitude to the 1600 people who work every day to make our city work for the people of West Palm Beach. West Palm Beach has become a modern-day symbol of what’s possible when people decide to go big and pull together. That’s why after eight years as your Mayor, I’ve never felt more honored to have served you and more hopeful about where we are and where we are headed. Our neighborhoods feel special again. Our businesses are on the move again. Our reputation as a world class city is on the rise. Our city, more than ever, is united. But, I want you to know something personal, and from my heart. As hard as I’ve worked to change the fortunes of one of Florida’s greatest places to live, work, and raise a family, the city also changed me in some very good ways. I no longer fear challenges but welcome them. Instead of dwelling on what doesn’t work, I’ve devoted myself -- full time – to showing what can work. And, over the course of 8 years of service as your Mayor, I’ve become more aware that what truly powers this great city are the people who care enough to make it great. Along the way, we’ve challenged those who chose to see life as it is – not how it can be or should be. Who prefer to be stuck in the past instead of embracing the promise of the future. Who seek personal advantage by dividing us over the strength of common interest that binds us. My job was to ensure we were doing everything to make West Palm Beach a better place for all. So, I was thinking about this recently when I read this simple but powerful article in the national business magazine “Fast Company” whichsuggests 25 ways to make America’s cities healthy, safe and connected. Things like citizens getting more involved in civic life, not just by voting in elections—which is important, of course-- but by weighing in for something positive between elections. Like improving mass transit to replace congestion with convenience. Like making a city available and accessible to all by welcoming all who come, regardless of their nationality, or the color of their skin, or their sexual orientation, or their political views. Diversity should not breed adversity. The business article sums it all up by saying, “champion something really big and remarkable, then make it happen”. Here in West Palm Beach, we live by that credo. As Mayor I’ve served by that credo. In a place where the initials “WPB” stand for “witnessing people’s best”. Eight years ago, you and I began this journey together as West Palm Beach was still hurting from the nation’s greatest economic downturn since the Great Depression. I don't have to remind you how difficult times were for many of us--families and businesses alike. They were equally tough for the City. Gone was money for infrastructure and for vital civic upgrades like road repairs, new fire stations, and park improvements. Development, business development, and investment in our City had all but ceased. Back then, the focus was to provide residents with basic city services and, very simply, to keep the lights on. There was no strategic plan, no stormwater plan, no mobility plan, no water plan, no drought plan. Worse still, our confidence was being overwhelmed by caution and concern. This State of the City address… It’s about not only what we accomplished but also about what we overcame. So, you sent me to City Hall to renew our city and restore the faith…to create jobs, improve basic services, secure public safety, and position West Palm Beach as one of the best, boldest and brightest American cities. It was a time to act, beginning with a return to the basics. Formulated and announced during my first mayoral campaign, it came to be known as the "The J.E.R.I. Plan"—an acronym for Jobs, Environment, Reorganization, and Integrity. Jobs –that were real and better-paying, backed by companies that saw West Palm as one of the best business addresses in the United States. Environment – one that was sustainable, safe and protected for a city whose fortunes and future depend on it. Reorganization – to ensure the city delivered services to its citizens better, faster and more efficiently. And integrity – that value that ensures that those who lead us are every bit as good as the people they serve, that they merit the trust we put in them to reject what’s wrong and do what’s right. Eight years later, you and I have witnessed one of the greatest periods of progress and prosperity in the history of our city. When I was just getting settled in City Hall, we were all unsettled by the unemployment rate in our City; it stood at 9.1 percent. People were hurting. So, we rolled up our sleeves and got to work, in both the public and private sectors. Today, our unemployment rate stands at 3 percent, almost a full point lower than the national average, and in the last five years, job growth has risen 20 percent, more than double the national average. This, after we established an Office of Economic Development and created an Economic Development Plan. Our work force is increasingly entrepreneurial and innovative, with a high share of self-employed individuals and an above-average number of patent-holding investors, and—fueled by the large number of millennials choosing to make West Palm Beach their home and place of business-- our city is becoming a tech hub. Eight years ago, there was no Flagler Financial District. Now, a cluster of nearly 250 financial services companies call it home, sending the message that we are a financial services destination. Eight years ago, we struggled with limited Class-A office space and with few strategies to manage growth along the Okeechobee Corridor. We decided to change all that, establishing the Okeechobee Business District to manage growth, attract more Class-A office space, and improve mobility along the Corridor. It’s just another sign that West Palm Beach means business when it comes to future business, and higher-paying jobs for the people who live here. Eight years ago, property values in West Palm Beach stood at $8.8 billion. Today, they are up almost 45 percent to $12.7 billion, and that means nearly every property owner in our City is better off today than they were eight years ago. We have an outlet mall, that was visited by more than four million people last year. More than 135,000 people now arrive in our city by high speed rail. We’re now the home of Spring Training and a Restoration Hardware that has exceeded all expectations. Ours is a city on the move, because people are bullish about West Palm Beach. But don’t just take it from me! From “J for jobs”, let’s move next to the “e” in the plan: environment, one of the most important priorities I’ve had as Mayor. I’m happy to report we’ve made real progress there as well. I established the Mayor’s Office of Sustainability, and West Palm Beach earned a 4-STAR rating from the national STAR Community Rating System, becoming the only city in Florida to have earned this distinction. We pledged to convert our fleet to non-fossil fuel by 2025 and committed to net-zero carbon emissions by 2050. We were awarded “SolSmart Gold” by the Department of Energy for advancing solar energy growth, and we are now on our way to spending $1-million on shade trees to make our city more walkable. In 2014, we adopted a holistic Stormwater Master Plan, the first-of-its-kind in South Florida. And, today, I’m pleased to announce the completion of a new, state-of-the-art, water treatment plant—considered one of the best in the country-- which will use cutting-edge ultraviolet light -- and a powder-activated carbon system -- to preserve and protect West Palm Beach’s award-winning water. I’m proud – and relieved – to report we now have drought-proofing measures to protect our water supply AND a system to defend against threats like blue-green algae. We also continue to battle the encroachment of State Road 7 onto Grassy Waters Preserve--the source of our drinking water and a 23 square mile pristine remnant of the Everglades! The health and safety of everyone in West Palm Beach depends on it. The third letter in the plan, “R”, stands for reorganization. To me it meant government had to be more efficient in delivering more -- and better -- services to our citizens. So, to achieve our shared vision of a city that’s economically prosperous, operationally efficient, and financially sound, we cut red tape and eliminated bureaucracy at City Hall. We reorganized or consolidated several departments, including Development Services, and established a new standard for speed of service. One example? 99 percent of all building, mechanical and electrical inspections phoned-in by 7 a.m. are now conducted that very same day. Today, I’m pleased to report, our financial position is strong and has led to national recognition by credit rating agencies. And after modifying the approach to investing City funds, income has increased 42-percent in the last three years. In 2012, we established a 10-year finance plan, the first of its kind in the city. A new hotel, waterfront restaurant, and residential units rising in the place of the Old City Hall. Next year, the Bristol comes online and promises to add an estimated $659-million of taxable property. The Warehouse District, a $6-million investment spurred on entirely by the private sector, has sold for almost $19-million. In the Historic Northwest, the Sunset Lounge is rising and breathing new life into this historic African American community. The lounge and ancillary projects -- including a bed and breakfast -- will pave the way for an African-American history tourism destination AND more jobs. In the last couple years, we focused on making West Palm Beach a vibrant city—a City where people want to be, want to live, want to work, and want to be a part of. To that end, we’ve made quality of life, public spaces, walkability, and transit all top-shelf priorities. Cities that thrive all have great transportation networks, with equitable and efficient mobility options available to all. West Palm Beach now has a mobility plan for downtown which has already identified 45-plus potential projects, including streetscaping, bike lanes, trolley enhancements and transit improvements. Some of those are being implemented now, such as the Clematis Streetscape giving a makeover to one of the City’s most iconic streets. We instituted bike share and have expanded -- and will continue to expand -- our trolley routes. In the last year, we kicked off Vision Zero, becoming the first municipality in Palm Beach County to pledge to adopt engineering, education and enforcement strategies to make our roads safer. In terms of public life enhancements, in addition to our Art in Public Places program, we’ve created an Office of Public Life—the first such office in the country—to make public spaces one of the hallmarks of West Palm Beach life. At the Mandel Public Library, we’re leading the way in South Florida, through programming that didn’t exist 8-years ago, and we’ve also made new investments in our neighborhoods, the lifeblood of any great city. To better connect people to services – and to each other – we’ve made West Palm Beach data-driven and citizen-oriented. Today, I am proud to unveil our online Open Data Portal, which will allow the City to share and work with data in conjunction with the community. This portal aligns with our commitment to transparency and complements our West Palm Working Online Performance Dashboard. Want to know what these quality-of-life issues mean for the future of West Palm Beach? Here’s a look, through the eyes of City employees. Now that we have talked about many of our achievements, it is time to talk about what still needs to be done. And I’m going to talk specifically about three challenges affecting not just West Palm Beach but every city in America: Crime. Homelessness. And poverty. Yes. I’m proud of the fact that preliminary reports show our overall crime rate is at a 20-year low, and we’ve made great advancements in addressing violent crime through programs and technology like the Real Time Crime Center and ShotSpotter. But we must do more to address the root causes of violent crime. Because for our city to feel good about itself, the people who live here must feel safe. Homelessness. It’s a problem that bedevils every city in America. We’re not ignoring it. In fact, West Palm Beach is doing more than any municipality around to address it. This fiscal year, the City budgeted more than $4-million for Vickers House operations, supportive housing, a full-time homeless outreach team and many more efforts to address the issue of homelessness in our City. Of course, we are grateful for our many partners in the non-profit community who are working diligently to improve outcomes. But, as a society, we must ask ourselves—and our partners at the county, state, and federal levels-- questions that we haven’t fully answered: Are we doing enough to create affordable housing or shelter? And, are we doing enough to address the mental and behavioral health issues that, so often, factor into homelessness? And finally, poverty. Our poverty rate stands at 17-percent, which is difficult to understand considering that our unemployment rate is so low. So, today, I challenge you, as business leaders, to create opportunities for those who need them most. Hire one of our young people, or an ex-felon, or someone who is homeless. How do we lift people out of poverty in West Palm Beach? How do we address the roots of violent crime? During the last eight years, we started a dialogue that led to action with the Mayor’s Village Initiative. Over the last few months, with significant input from the community, The Mayor’s Village Initiative has developed an action plan –-- a framework for a healthy and safe community. And I challenge the next Mayor to make implementation of this framework one of the city’s greatest future achievements. The final letter in my blueprint for West Palm Beach – the letter “I” – stands for integrity. I believe there is no greater need in public service today, and no greater quality in those who serve, than showing the kind of character that people can trust and want to rally behind. It’s the way I’ve governed, and the way I live. Because as Mayor of this incredible city, with more than 1600 employees, you don’t command respect. You earn it. You don’t ask for loyalty without being true to others. When you fail to lead by example, you can’t expect to succeed as a leader. These were the principles on which I ran, and on which I stand. And because of your incredible friendship and support for me – and your city – over these past eight years, these are the principles that have redefined West Palm Beach as a world-class city with world-class ideas and world-class people. With your permission, I’d like to close on a more personal note. To my leadership team including City Administrator Jeff Green, Deputy City Administrator Dorritt Miller, and Assistant City Administrator Scott Kelly. Thank you for making my dreams for our city a reality. To our first responders who are committed to saving the lives of others despite the risk to their own. To our business leaders who shared my vision that we could grow a vibrant economy by growing quality of life. To our neighborhood leaders who believe, as I do, that the health of any city is best measured by the strength and diversity of its neighborhoods. To our environmental leaders who believe that protecting our future begins by protecting our God-given natural resources. To the parents who devote their lives to our children. To the people of West Palm Beach. You’re the reason I’m here. You’re the inspiration for why I’m here. You’ve made my eight years as Mayor both productive and meaningful. In return, I ask that you never stop believing in the greatness of West Palm Beach. And that greatness…rests in you. And finally, to my family, my dear husband Charles, who has had to put up with so much; my fabulous daughter and son in law, Dr. Jessica Muoio and Kem Alexander; and my amazing grandchildren, Jordan, Jada, and Julian. Thank you for supporting me through this opportunity of a lifetime. I love you all. As for my future, I plan to take the West Palm Beach story to the rest of America. To show what’s possible when people pull together, dare to dream, and have the courage to make their dreams a reality. Thank you for the privilege of being your Mayor.